Today we as a church and as Christians come together to commemorate St Peter and St Paul. Many, when thinking about the early church, mistakenly believe that in the times of Peter and Paul, that the church was filled with love, respect and agreement; but in fact, it was much the same in many ways as the experience we have in churches today. However, there was turmoil, dissension, and disagreement. In the times of Peter and Paul, it was even more difficult than we have it today to iron things out, to come to an agreement that it is today, as we have two thousand years of experience helping us to to deal with issues that the church. In the time of Peter and Paul they didn’t have a history to draw upon to assist them. Let us look at Peter and Paul. Both Peter and Paul were very gifted church leaders, however both came from entirely different backgrounds. They each had different educational backgrounds and distinct personalities. Due to this, some of the churches, mostly in Corinth, were divided into rival parties depending on whether they preferred Peter or Paul. What made them so different from each other, these two great church leaders and Apostles? Peter was a person who had much less education than Paul. He was a fisherman by trade and was married with a family. Peter had the blessed privilege of having both known and worked alongside Jesus during his earthly ministry. Peter was a simple man, who our Lord Jesus chose to lead the other Apostles, but he was also a rather impulsive by nature and would often speak and act without thinking first. Peter was passionately sincere in his love of our Lord, but seemed to find it difficult to put things into writing and this can be seen if you compare his letters with those of Paul. Paul, by contrast, was a graduate of the universities of that day. He had been tutored by Gamaliel, who was a famous leader of a school of Rabbis. Largely due to this, Paul knew the scriptures inside-out and was a person who lived strictly by Jewish law. He was fluent in Greek, and knew enough Latin to get by. Paul had spent his early years persecuting Christians, so because of his experience, he was able to see things both from the Jewish and the Christian perspectives. 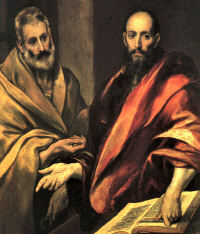 Because of their differences, Peter and Paul didn’t always get along of agree with each other and we know from Paul’s letter to the Galatians that the two had a major row in Antioch about the question of whether Jews who had converted to Christianity could eat separately from their Gentile brethren. Paul was firmly in favour of the principle that both Jews and Gentiles should eat together, because he saw that unless this happened, it would lead to two separate Eucharists, one for the Jews and a separate one for the Gentiles in each church and that from there it would only be a short step to rebuilding the division which Our Lord Jesus, through his cross and resurrection had broken down. Peter, however, felt differently. He felt sorry for the Jewish Christians because they were expected to leave behind the habits they had done all their lives upon becoming Christian. So, he agreed to eat with the Jews separately and even persuaded Paul’s friend, Barnabas to join him. So although both Peter and Paul had the best of intentions, they both came to see each other as one who was letting the side down. However, years later, both Peter and Paul were able to make up their differences. Even in our churches today we see similar issues. We have the people like St Peter, who are kind and generous, and who want the church to be a welcoming place where everyone gets on happily together, but in doing so, are a bit too lenient and cause the message of Christ’s salvation to be blurred. Then we have people like St Paul, who realise that if the truth which is in Jesus is allowed to be obscured or rejected in the cause of kindness, generosity and inclusion, that the church could end up more like a club of kind people and less like the living Body of Christ on earth, losing the message of salvation. From their disagreement, we can see that, regardless of our personal beliefs, there are specific truths to which we must cling in order to fully serve the Lord. As our Lord prayed, so do we: That we all may be one, as Christ and the Father are One. Both Peter and Paul were put to death in a great persecution that had broken out in Rome under the Emperor Nero, following a great fire in AD 64, which Nero probably started and blamed upon the Christians. We know that before this, Peter had wrote his second letter and had come to realise the importance of Paul, just as Paul had also realised the importance of Peter.